Patients and doctors alike prefer Achilles tendon surgery when it comes to Achilles tendonitis treatment. In such a surgical procedure, the objective is to attach the torn ends of the tendon. The tendon stands a better chance of not getting ruptured again this way, when compared to orthodox methods like using a brace, splint or a cast. These devices only keep the leg immobilized but do nothing about the actual Achilles tendon rupture. The surgeon makes only one incision which is generally about 5 cm long and ensures that all the torn fibers in the tendon are stitched back together and then left to heal. In this surgery, a number of small incisions are made by the surgeon. These incisions make for faster healing and also allow the surgeon to see the entire length of the tendon and stitch it back together. A tear is considered chronic if the muscle is shortened. That is, it has been weeks or months since the rupture and the patient has still not had it operated. In this case, the tendon tears further and their ends are separated which results in the muscle being shortened. In such a situation, non surgical treatment no longer stands a chance as the whole tendon needs to be repaired before setting it to heal. In this case, the most important factors are the separation present and the size of the gap present between the tendons. An Achilles tendon tear is acute if the patient consults a doctor within a couple of weeks of the incident that ruptured his Achilles tendon. In most acute tear cases, the separation is pretty minimal and the ends of the tendon can be stitched back together. With the increase in the gap, more drastic measures are to be taken. This can range anywhere between using a simple strip of the present tendon to using a different tendon for tendon transfer or talking to a tissue bank about an Achilles tendon graft. Tendon transfers are not performed widely, as it is done only when the gap present in very wide. 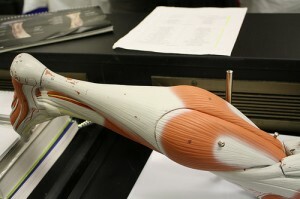 The tendon used during the transfer is generally the next strongest tendon present in the leg. This is the flexor hallucis longus, the muscle present next to the big toe. This muscle is nowhere as strong as the gastroceniumus which helps power the entire leg. The procedure is also a bit risky as there is a possibility of nerve and blood vessel damage. However, patients normally recover after their tendon transfers are successful and some can even return to playing regular sports. An Achilles tendon surgery offers the best results only if the procedure is performed at the earliest. The greater the delay, the greater is the risk of damaging the tendon, so make sure that you keep an eye on the symptoms and opt for regular medical checkups. This entry was posted in Achilles Tendon Rupture and tagged achilles tendon rupture, achilles tendon surgery types, ruptured achilles tendon, types of achilles tendon surgery, types of ruptured achilles tendon by Zipheal Editorial Staff. Bookmark the permalink.